9-inch Tight top memory foam mattress features a high density gel foam layer on top for exceptional support, faster recovery and cooler sleeping surface for a great night's sleep. This mattress has a soft jacquard fabric cover that creates a breathable sleep surface. Your new CLOUDzzzTM Mattress is covered by a 12-year Limited Warranty. 12 years following your CLOUDzzzTM Mattress purchase, if you experience a manufacturer defect that is covered under our warranty, we will offer a one-time replacement or repair of the original mattress size purchased. This includes all components of the mattress. There is no fee or deductible required. Feel properly supported on our Chiropractic Form mattress; the only mattress endorsed and recommended by the Canadian Chiropractic Association. The goal in our Chiropractic collection is to promote correct postural alignment and give you a healthier night's sleep. The Zoned Pocket Coils is thicker in the centre third to support your body where it needs it the most; where we carry 60% of our weight. The foam conforms to your curves to ensure all preassure points are being alleviated. Lastly, the Eurotrex Visco Gel Memory foam is an extremely open cell foam that surrounds to your shape and helps regulate your body temperature. Conveniently roll packed into a box for easy delivery and set up. Canadian Made, Canadian Owned. Add relaxation and rejuvenation to your life with the Aurora 9In Pocket Coil Mattress. This 9In Mattress features 13 Gauge 7.1In Pocket Coils with multiple layers of foam padding for added comfort and support. The individual pocket coil technology reduces motion transfer throughout the mattress allowing for an undisturbed and restful sleep while the 1.18In Foam 22D and 0.8In Foam 20D layers conform to your body. This mattress also includes flame resistant fabrics that meet federal flammability standards for safety and peace of mind. The Aurora 9In Pocket Coil Mattress comes compressed and rolled in a boxed for convenient pickup and delivery. Thanks to a high-tech design and a careful selection of top-notch materials, the Kalani offers 10In of pure heaven in a mattress! Beginning with a luxurious Aloe Vera infused double-jacquard polyester cover; each layer of this mattress delivers ultimate comfort combined with lasting durability. Soft to the touch, the Aloe Vera covering promotes a healthy sleep by rejuvenating your skin and supplying natural anti-microbial and anti-fungal properties that keep the fabric fresh. A 7.5In layer of high-density foam provides the majority of the structural support to your body, giving the mattress a sturdy yet cozy surface with pressure-relieving benefits. A soft 2.5In gel foam layer located on top of the high-density foam layer gently cradles your body with a refreshing, cooling sensation as it disperses body heat. With a 10 year prorated warranty, enjoy years of incomparable comfort and relaxing sleep. This mattress boasts a unique layering of the finest materials all beautifully enclosed in a durable, easy to clean double jacquard polyester fabric. A firm 7In and soft 2In polyurethane foam layer provide the primary structural support to this mattress. 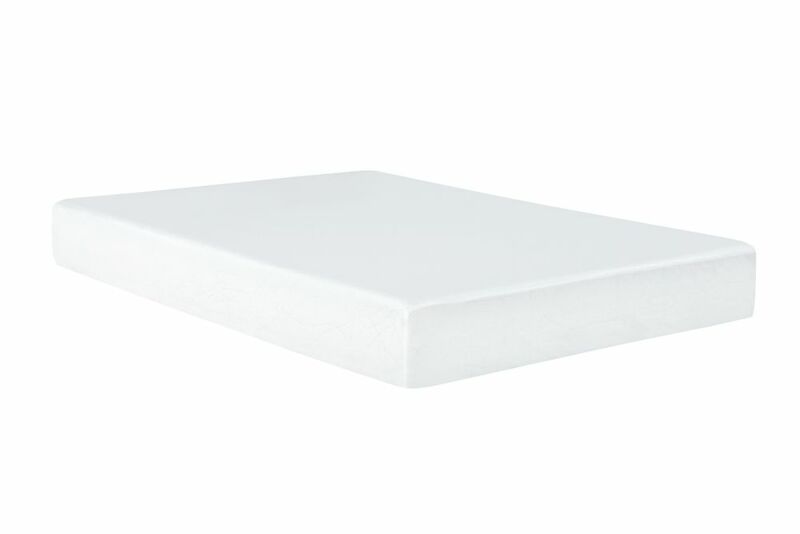 Comfortable yet sturdy, these two sheets supply a solid foundation for the gel foam, memory foam and tight-top to rest upon. As you sleep, your body heat will be evenly dispersed thanks to a cushiony 3In gel memory foam layer that cocoons your body. The 1In memory foam conforms to your body and reduces motion transfer, while evenly distributing your body weight along its surface. This helps to minimize pressure from your shoulders and hips as you sleep, so you wake up free of any aches and pains. With a 15 year prorated warranty, you will be sure to enjoy years of rejuvenating sleep. Queen-Size 9-inch H Mattress with Gel Memory Foam 9-inch Tight top memory foam mattress features a high density gel foam layer on top for exceptional support, faster recovery and cooler sleeping surface for a great night's sleep. This mattress has a soft jacquard fabric cover that creates a breathable sleep surface. Queen-Size 9-inch H Mattress with Gel Memory Foam is rated 3.1 out of 5 by 7. Rated 4 out of 5 by Crystalccc from Great bed for the price ! Having seen mattresses sell for 700+ and up, I first had my concerns with this product. However, the item came properly sealed with very basic instructions and it feels great! Soft but not too soft, this mattress is definitely one to keep you sleeping. Would recommend to other customers who are price sensitive but still looking for something that could last and if comfortable. Rated 5 out of 5 by Linda from Great mattress I am very pleased with this mattress. It arrived quickly. It didn’t take very long for it to rise to its full height. No smell . It’s a firm mattress. The price is right! Wouldn’t hesitate to order this again. Rated 1 out of 5 by joeking from Not 9" as described, how can i get a refund I have been waiting for this item to expand to 9" following delievery it doesn't seem to be happending. How can I return or replace this because I can not pay for more and receive less. This is unexpectable. Rated 5 out of 5 by Meghan from Great,more than what I've expected I am realy happy that I've bought this gel mattress. What type of foam is in this mattress?